In California, anti-vaccination parents have latched on to doctors willing to grant exemption from a state law requiring kids to get specified shots to attend school. The doctors “are wielding that power liberally and sometimes for cash: signing dozens—even hundreds—of exemptions for children in far-off communities,” KHN reported. Based on widely accepted federal guidelines, vaccine exemptions for medical reasons should be exceedingly rare. They’re typically reserved for children who are allergic to vaccine components, who have had a previous reaction to a vaccine, or whose immune systems are compromised, including kids being treated for cancer. Run-of-the-mill allergies and asthma aren’t reasons to delay or avoid vaccines, according to the U.S. Centers for Disease Control and Prevention. Neither is autism or fear of autism. Before California’s immunization law took effect, just a fraction of 1 percent of the state’s schoolchildren had medical exemptions. By last school year, 105 schools, scattered across the state, reported that 10 percent or more of their kindergartners had been granted medical exemptions. In 31 of those schools, 20 percent or more of the kindergartners had medical exemptions. In Oregon, where health officials are battling a measles outbreak, it is nonmedical exemptions—personal or religious—that have caused concern. Oregon recorded 31,000 nonmedical vaccination exemptions, hitting the highest rate among kindergartners in the nation, KHN reported. Under state law, officials had no choice but to approve almost 30,000 of the exemptions after parents watched a 20-minute online video, then printed out their own forms to present at school. Officials noted that applicants have given phony names (Mickey Mouse) and used the system to berate doctors and vaccination requirements. State lawmakers have talked about toughening the law, perhaps even eliminating nonmedical exemptions, as have California, Mississippi, and West Virginia. But that idea has provoked angry responses, and it’s unclear if more rigorous vaccination laws will be put in place. In my practice, I see not only the harms that patients suffer while seeking medical services, but also the damage that can be inflicted on babies and children in medical care. No parents want to see their youngsters sick or even to die from preventable diseases. The reduction or even eradication of infectious childhood illnesses has been a major medical accomplishment, experts say. But that progress, as well as our collective health, is at risk due to unfounded fear and suspicions, as well as rejection or hesitation, about inoculations. Vaccinations, like all medical treatments, are not risk free. But their benefits far outweigh their risks, and they play a huge part in protecting the health not only of youngsters but us all. Their maximum effect occurs only when vaccination thresholds are reached, so communities enjoy “herd immunity,” a shared and amplified protection against disease. Depending on the illness, 90-plus percent of youngsters in a school may need to be vaccinated for herd immunity to work. That also means that exemptions need to be rare and few. 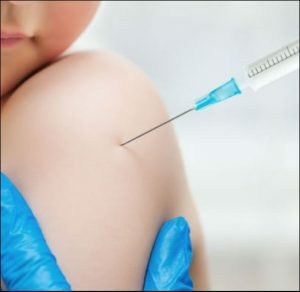 California health and medical licensing officials have said they will be scrutinizing medical exemptions for vaccination in the Golden State. But only one doctor, so far, has been subject to professional discipline by licensing authorities for not only granting exemptions but also for his opposition to vaccination. We can do better. Doctors, lawmakers, and regulators need to hold a firm line on vaccinations to protect us all. Sure, by analogy, any grownup can be free to stand outdoors and light matches, one by one. But if they flick them into a dry grassy pasture next to a town, well, there are laws about that. By the way, get those recommended shots yourself and get them for all your loved ones, too.